If we are lucky, we will learn something new every day. Well, today I was lucky. Recently I have been doing research into the early Polish-Catholic settlers of Detroit for a series of articles. These early founders of the PolishAmerican Catholic Church faced extreme prejudice and hardships, yet they never lost sight of what was truly important: their faith. They sought solace and solidarity within the confines of this faith; faith practiced not only on holidays and Sundays, but faith that was truly a living part of their daily life. To honor this faith, and to practice it among people who spoke the same language and who remembered the same traditions, they built churches…many many churches. 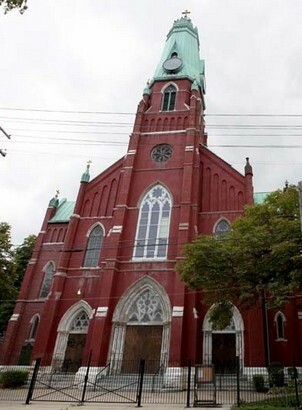 One such church was St. Albertus Catholic Church on St. Aubin St., built between 1883-1885, and dedicated on July 4, 1885. At one time this beautiful church was the largest Catholic Church in Michigan. So it was a wonderful surprise today when my brother forwarded a Detroit news article about St. Albertus and an event orchestrated by the Catholic Mass Mob of Detroit. Begun in Buffalo, NY Mass Mobs have spread across Lake Erie to Detroit and all around the country. As noted in this article by Kevin O’Connor, word goes out, and a mass mob gathering occurs at a historic church in need, “… it’s to boost the city’s struggling old churches, filling not only the often sparsely attended shrines, but their collection plates, too.” Over 2500 Catholics answered the call yesterday. There is no better way to honor the builders of these shrines than to fill the pews once more. Kudos to the Mass Mob of Detroit! Having bought a copy of the book Discovering Stain Glass in Detroit, which profiles the beautiful artisry of Detroit area churches, I look forward to attending a mass mob in the future.